Great smocking instructions ebook with complete instructions with easy to follow diagrams. Smocking is the art of gathering fabric in a specific way. It is mainly used for enhancing dresses, blouses children's clothes and more. 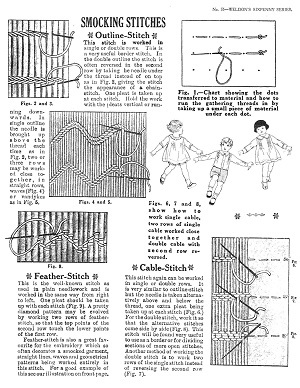 However, other items made from fabric could include this sewing technique. Weldon's Smocking is an ebook that will teach you how to perform this sewing technique. The next section of the ebook goes on to talk about the various smocking stitches. There is an outline stitch good for borders, the feather stitch which is used for decorative purposes and the cable stitch which can be used as a border similar to the outline stitch. Another stitch that is used in smocking is called honeycombing. The stitch is typically done to form diamonds, straight bands, points or squares. The Weldon's smocking instructions ebook has in-depth instructions, as well as illustrations, on how to do these stitches. Patterns can be made by putting these stitches together in a particular order. 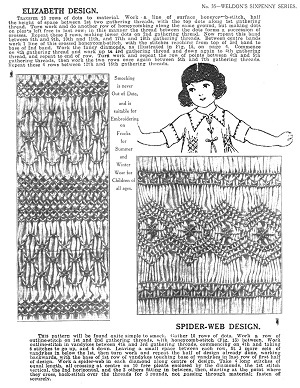 This ebook covers some popular patterns for your convenience. The Wave and Vandyke pattern is just one example. It is a just a design made up of the simple stitches popularly used in smocking. You can view the picture of what the pattern looks like in the book alongside the instructions on how to do it. Other patterns are described in detail too, which makes this ebook quite useful in teaching you how to smock. Some can be used for borders or edgings. Italian smocking is another name for pattern shirring, and it is explained in this smocking instructions ebook. The Italian peasants have long been well-known for their skill with a needle. Much of their knowledge is passed down generation to generation. This pattern is created during the early stages of gathering and is worked extremely close together. It is truly one of the prettiest types of smocking. 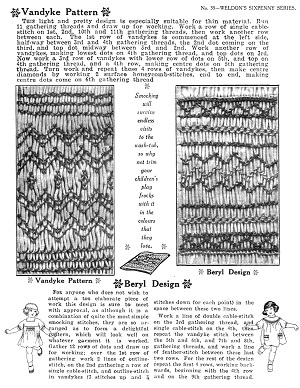 For more details on the various patterns created with this technique consult this ebook by Weldon. This ebook includes two sizes of smock-pleating grids to help you chart your designs. One is a 1/4-inch, which will work on average fabrics and the other one is a 3/16-inch grid, which will work for the finer fabrics. The instructions included with these grids explain the best way to use them including transferring them to freezer paper or onto the fabrics. Smocking is such a part of sewing history it is nice to know that this ebook is helping to teach you and others how to do it. Hand crafts should be passed on and not allow to die out. 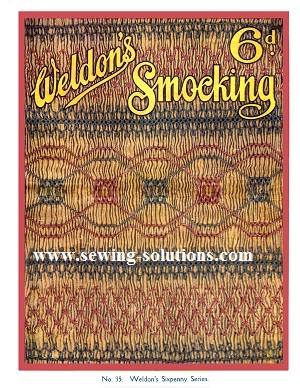 So check this Weldon's Smocking ebook out today and see what you think.